Fit Tight flow meter insulation covers, or removable insulation jackets, are custom designed and manufactured to provide the insulation solution your application requires. Flow meters monitor and measure the flow of liquids or gases in a variety of industrial or process applications. They are used in the food and beverage industry, oil and gas plants, and chemical/pharmaceutical factories, and the liquids handled may be at extremes of temperature, viscosity, or may require strictest attention to sanitary and safe handling. In addition, the industrial environment may be noisy, vibrating, caustic, or otherwise threatening to the accuracy and integrity of the flow meter. Your Fit Tight flow meter insulation covers will address all these process and environmental challenges, and more. Fit Tight flow meter insulation covers are custom designed to meet the needs of your installation for temperature control, vibration reduction, or environmental protection. And they are easily removable for meter inspection and recalibration. Then when the job is done, the Fit Tight flow meter insulation cover can be quickly and easily replaced, saving time and money compared to using disposable insulation each time. Fit Tight design engineers will visit your site and evaluate your removable insulation cover requirements. 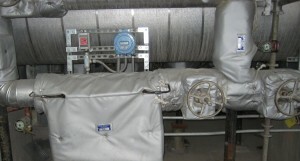 They will design the custom insulation cover required for any size and type of flow meter in your plant, and our manufacturing engineers will assure that the covers you receive are durable, long lasting, and specifically designed and manufactured to provide optimum flow meter protection and insulation. Our removable insulation covers are easy to install and easily removable by your maintenance crew for inspection, recalibration, and servicing. Fit Tight flow meter insulation covers can be removed and installed in minutes, thus saving the expense and downtime of reinsulating. Your Fit Tight durable, removable flow meter insulation blankets – also called flow meter insulation covers – will save money and labor each time you use them. Let Fit Tight be the solution to your flow meter insulation cover needs. For more information or to schedule a consultation, you can contact our team here or request a quote for your specific custom flow meter insulation covers.